One of our newest and largest construction to date, Bengal Gardens, is now open to the public. Come and view our amazing Tigers in their new home from the visitors centre. Learn about Tigers in the wild, the importance of conservation and come face-to-face with these beautiful predators through our viewing window! You could also go behind the scenes with our Tiger Feeding experience or Tiger Tours! For more information on this go to our Experiences page! Bengal Tigers are one of the most endangered species in the world and their numbers are rapidly diminishing. These amazing creatures need our help to save them from habitat loss, hunting & illegal trade. 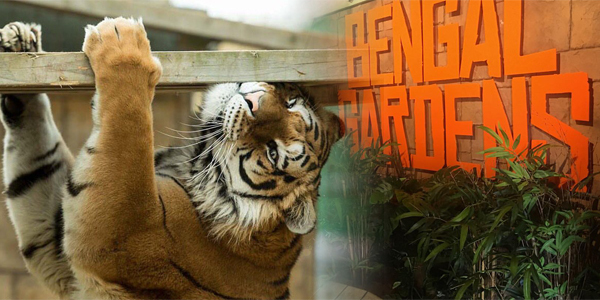 Lincolnshire Wildlife Park is dedicated to the conservation and preservation of this amazing predator… you can be too! Please visit our Charity Information pages. Why not share a photo with us or leave your review! Thank You & we look forward to seeing you soon!